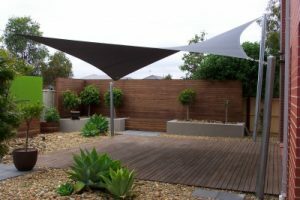 For sun protection that enhances the appearance and livability of your home or business, talk to Melbourne Shade Sails about our custom-made shades. We provide an expert measure and design service to ensure your new sail fits your home perfectly and provides the optimal amount of shade. We know that when you invest in custom shade sails, you want them to look good for a long time. Made of quality materials and with the added technology of UV inhibitors, our custom shades will stand the test of time, even under the harsh Australian sun. Each custom shade sail we produce is made to order. Occupying a large space, a poorly thought-out sail can be an eyesore; that’s why we listen to your needs and assess your property to ensure you get the perfect fit. No matter how big or small your area is, we can design and supply a blind to fit. We offer a range of colours with different levels of UV protection, as well as varied appearances. You can view the colours online here. Square and triangle shapes are available to suit all manner of applications and outdoor spaces. Have one of our expert technicians install your custom shade sail for you. We offer this service throughout Melbourne, all for an affordable cost. Use one of our simple installation packs to install the sail yourself. With instructions in plain English and quality parts, it’s easy to put up your own blind. If your home or business needs sun protection, don’t delay – call us today for a free measure and quote on one of our custom-made shades. Call 1300 99 32 37 now.